Relieved or not, Muriel is a pretty sweet lady – you can tell as soon as you meet her. 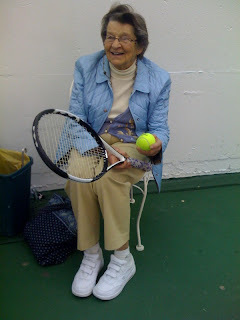 Ann brought her to tennis today, and instead of sitting in the lounge, she came right down onto the court with us and watched us play. I was charmed at first, but then panicked when I remembered what a foul mouth I have during these clinics. “What if we curse?” I asked Ann. That’s not the one that usually punctuates my game, but still I was nervous. The first time I missed a shot, I surprised myself with “Bugger!” (I’d never uttered that word before.) When Ann missed one, she shouted “Aw, Shucks!” Once I felt confident that we could all get through our mistakes without offending our distinguished guest, I relaxed significantly. We all played a bit better, having a cheering section. I think we all laughed harder too, had more fun. She saw all of Ann’s great plays, and she also spent time thumbing through something tiny and orange that I imagined to be a prayer book. I was feeling so proud of how we presented ourselves today. Although it’s not hard to impress a glass-is-full-to-the-brim woman like Muriel. Everything we did seemed to delight her. I’m going to go out on a limb here and say this: If we all had a Muriel on the sideline, stepping over the messes we leave on our floors, and reminding us of what we do best, we’d all play a better game. Every one of us. All the time. Interesting you should post this today. Just last night my lovely wife Debrah and I were discussing the effect of positive or negative reinforcement on actual accomplishment. Orson Welles for instance (the director of that unwatchable time-waster "Citizen Kane") was asked how he was able to be so confident and do award winning radio, Broadway, and films all at the same time. He replied that his parents had always told him he could do anything and he believed them. I have a nebbishy high school friend who was always worst on the baseball field till he went to summer camp, was given a cool nickname, and somehow earned the reputation as a slugger at the plate. Somehow he became that slugger. Meanwhile, on a recent visit with the in-laws, my wife was playing catch with our six year old and when he missed the ball his grandmother--who adores him, by the way--muttered "shlamazel". Deb felt a stab in her heart. It was the same type of negativity she had lived with throughout her childhood. And it has haunted her throughout her life. Way to be a buzz-killer Bill! hi Jessica -- love this. as a Fan of Muriel, you've really captured her: "glass full to the brim" ! you could argue that Muriel is so extraordinary, specifically in contrast to the normal "voiced disappointments" of most of us -- if we were all Muriel's, well... would there be any dirty clothes? she is endearing in her acceptance. she is always so special to be with.